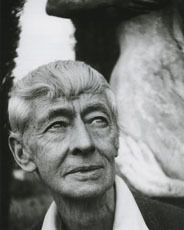 Norman Lindsay original Photograph in this Etching House web site was Published by The Lytlewode Press: photo credit: Keith E. Wingrove (1910-1995) Portrait of Norman Lindsay Photograph Springwood 1952. 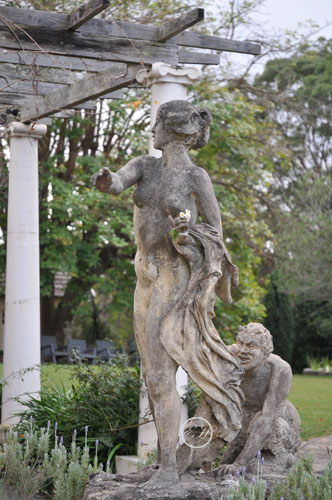 In this Etching House Gallery of Norman Lindsay Sculpture Garden there are some historical examples of Norman Lindsay’s amazing collection of sculpture works dating back to 1913. 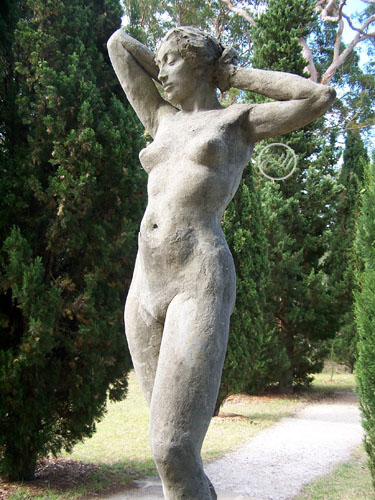 Norman Lindsay completed most of his sculptures between 1920 and 1940, but he was still actively working on some sculptures right up until his passing away in 1969. 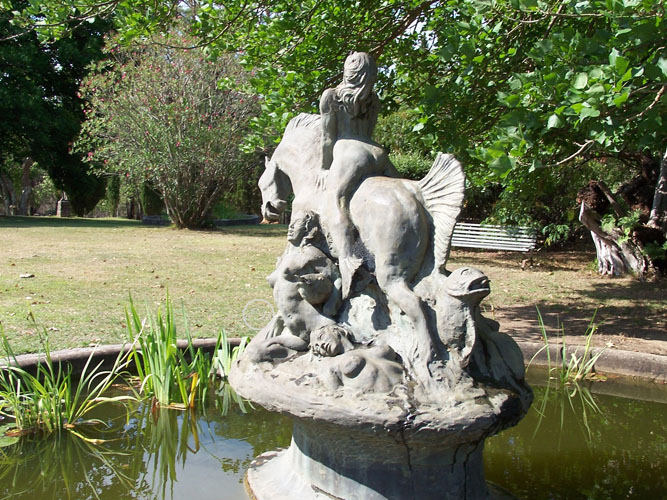 These pieces at his home in Springwood NSW may be seen 7 days a week, you can spend the whole day at his home and garden and want to come back again and again, there is also a incredible display of paintings etchings as well as ceramics, model ships, watercolours and etchings. 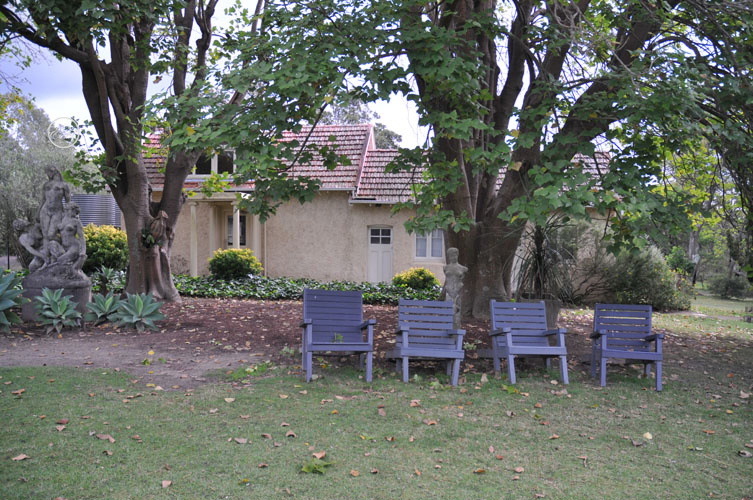 These images have been made available with kind permission form the estate management of the National Trust, the owners of this magnificent property and Australian heritage. 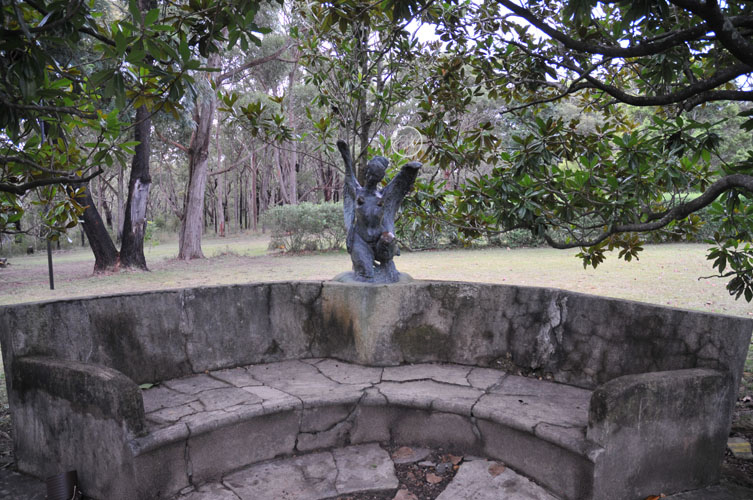 There are approximately fourteen sculptures, pots and urns in the garden at “Springwood”. 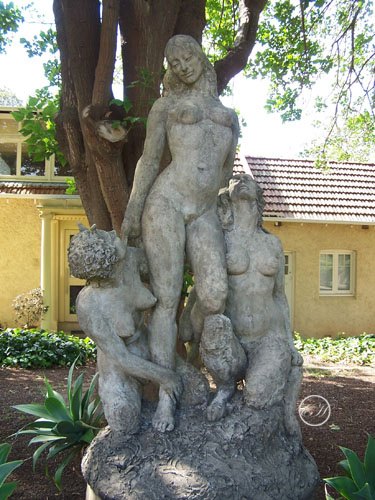 All were made by Norman Lindsay during his stay on the property. All of the originals are made of concrete, which was built on to a metal armature. In the 1980’s a decision was made to copy some of the sculptures to protect them from environmental and physical damage. The copies were made of bronze and the original works were moved inside the gallery. Please be aware that sculptures were not given formal names so work titles are often simply descriptive. 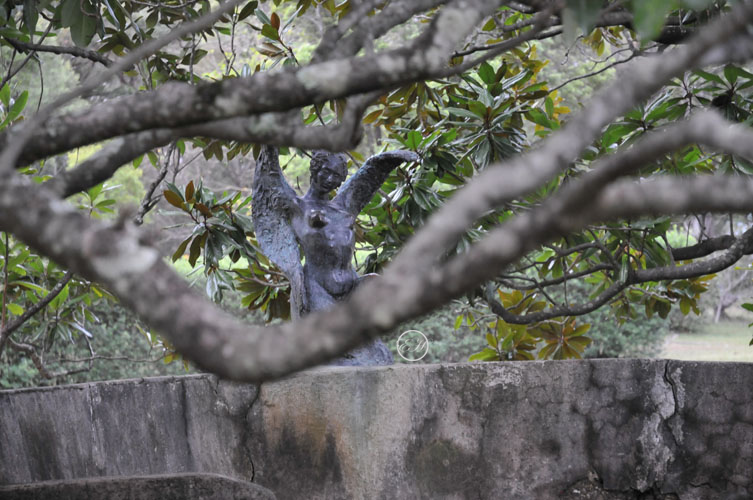 Working on Normans sculptures was his way of relaxing, his first piece was completed in the gardens of Springwood; it was quickly followed by a satyr pursuing a nymph at the front of his Springwood home. As with many of his works Rose was his model for the nymph. In the 1920’s the Greek Sphinx and The Sirens which lured sailors to their deaths began to appear in Lindsay’s sculpture. The first Sphinx was made in 1927 was small enough to decorate the radiator cap of Rose’s 1926 Vauxhall. Later, in 1943, he would create a large version on the pathway leading to the swimming pool. The Siren first appeared in 1926 and then again in 1928. All but the last of Lindsay’s sculptures were made by applying wet cement onto a metal frame. His final sculpture was from a full size plasticine model. There are also number of pots and urns crafted by Lindsay which found a home in his gardens. While visiting Norman Lindsay’s Home feel free to look at the original Oil Paintings in teh Norman Lindsay main gallery. After the First World War Norman Alfred Lindsay began to experiment and develop his skills as a watercolourist. His association with artist Balmier Young provided him with a foundation from which to expand his skill, building up on the initial washes to become quite dramatic and detailed. His watercolours are often emotional and always captivating with the viewer’s eye drawn to all parts of the paper which has been carefully constructed. Each of Lindsay’s works inevitably tell the story of each of the many characters which are depicted. It is unknown exactly how many watercolours Lindsay produced, rather it is said he was ‘prolific’. Lin Bloomfield retains the copyright on all of Norman Lindsay’s etchings and facsimile etchings, Editions are restricted to 550 and each is individually numbered. Authenticity is guaranteed by an embossed seal (see below) with a dot in the 6:00 o’clock position. All works have a Certificate of Authenticity and once an edition has sold out, the image is never again released. The facsimile etchings have retained and increased in both their popularity and value with many now in some cases commanding several thousand Australian Dollars. Etching House and other skilled Norman Lindsay specialists are often asked to validate the original pencil drawings as well as many other works made by Norman.